Taking a break between steep sections of the upper mountain. Long, steep, loose and a little dangerous. This hike has all the makings of an adventure. L ast month, I talked Manny Castillo into a failed attempt up Condor Peak. It was rough. Epic rough. 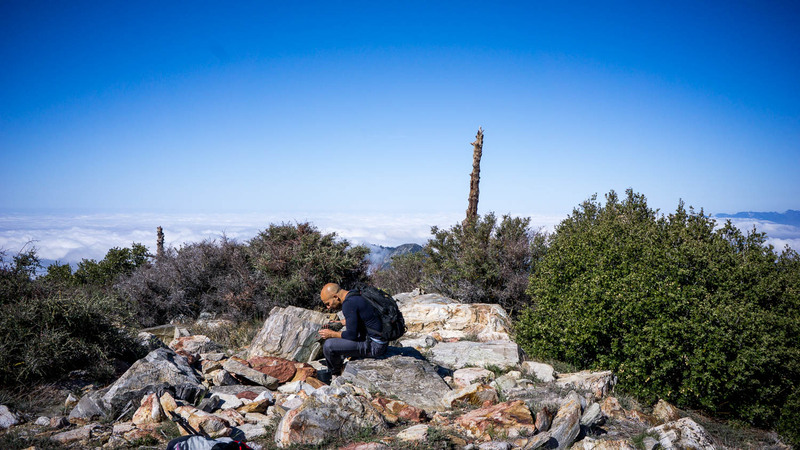 I’m not sure how, but somehow I managed to talk Manny Castillo into another hike – which would prove to be more “epic rough” than the last one. Our objective: Ontario Peak via Falling Rock Canyon. The Falling Rock Canyon route to Ontario Peak begins at Icehouse Canyon. 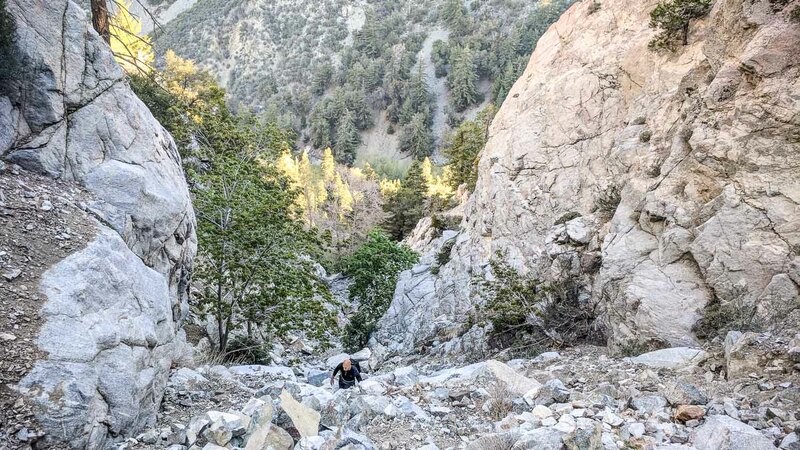 After a half mile, the route cuts across the creek then follows a steep avalanche chute to Sugarloaf Peak. 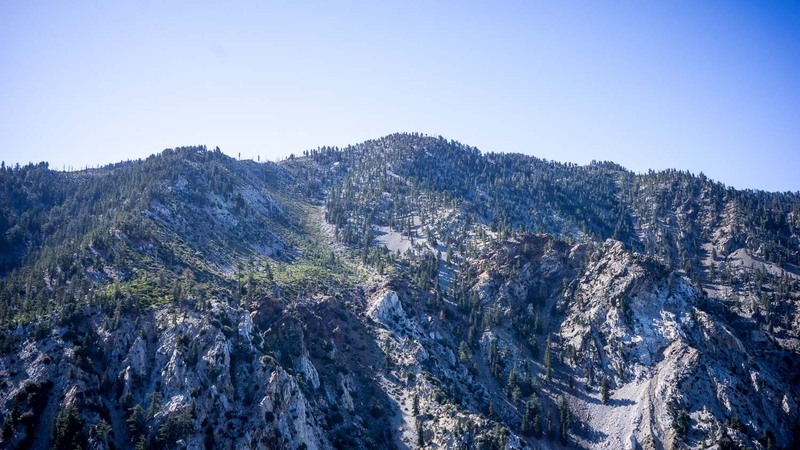 From there, the hike follows the contours of the ridges that connect the mountains to the summit. 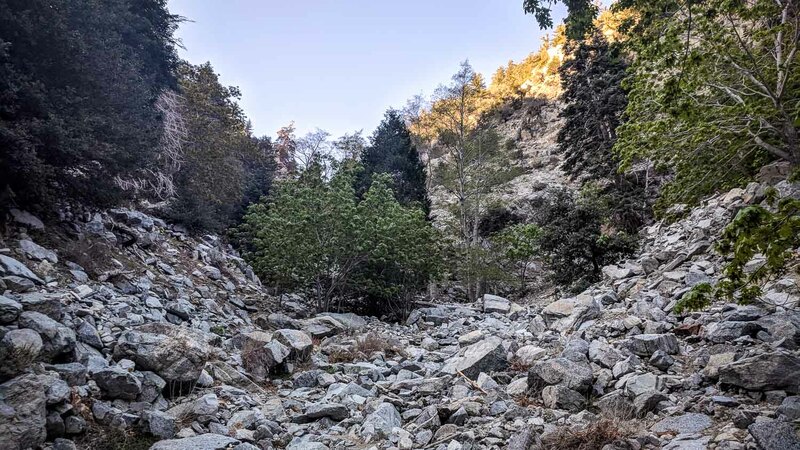 The canyon is lush and forested, but the further you go, the forest transitions into loose sand, scree, and boulders. Eventually, the route becomes so steep that we eventually had to climb side-by-side due to the boulders we were kicking loose with each step. It was nearly impossible to climb without creating a small avalanche. Fortunately, no one was below us. I didn’t think of bringing helmets, but I should have. As we approached the last 500 vertical feet toward Sugarloaf Peak, we became mired in deep sand and huge loose boulders. 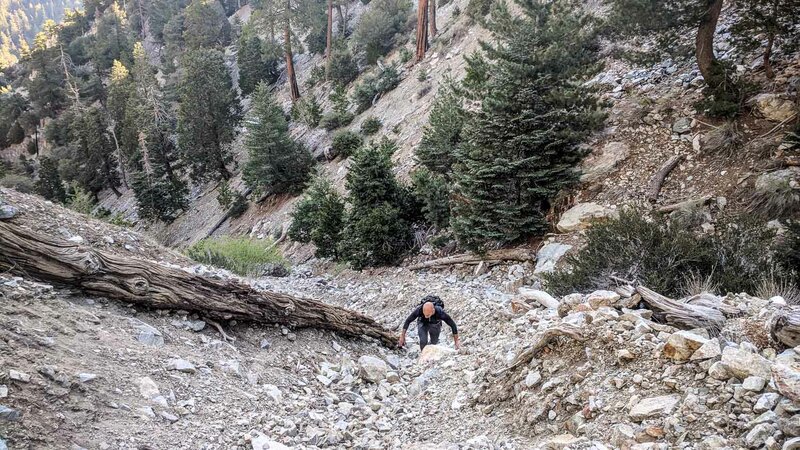 At one point, Manny’s attempts at trying to secure his footing turned into dog-paddling through the sand to keep himself from sliding down the shoot with the boulders he was kicking loose. Understandably, Manny was a little nervous. I have to admit, I was too. I thought about descending at this point, but I felt like it would be safer to push to the summit. If we could reach the summit ridge, we could descend on a well established trail. Near the top, it was extremely steep and loose class 3 bouldering, except every time we grabbed a handhold on a secure rock, the rock came loose in our hands. Every move had to be made slowly and with great care through this section. Eventually we made it to the ridge of Sugarloaf Peak where we could stand up and walk to the summit. It was a perfectly cool, clear day. We saw Ontario Peak across the valley, which was connected by a lower ridge. We took a much needed 20-minute break and snapped some pictures. As we crossed the narrow ridge between Sugarloaf and Ontario Peak, we lost some elevation, but at least there’s no more loose rock or avalanche chutes. 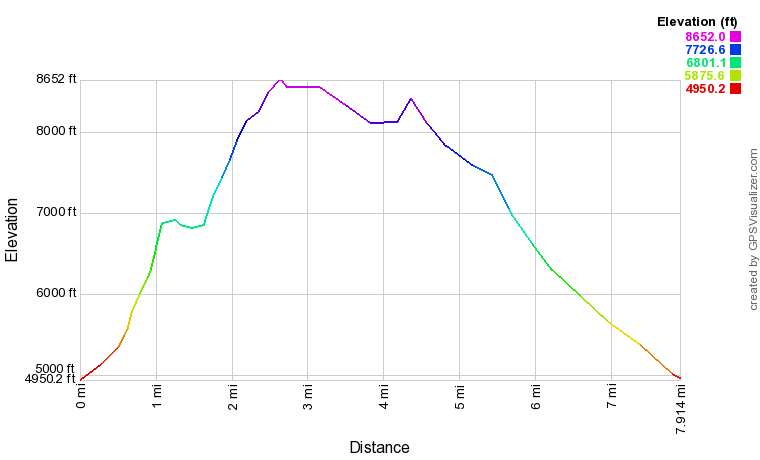 Still, it is really steep, as in “Register Ridge on Mount Baldy” steep. We slogged our way up for what seemed like forever, and every time we’d think we were almost to the top, there was always more mountain to climb. Eventually, we acquired the ridge, which led us to Ontario Peak. 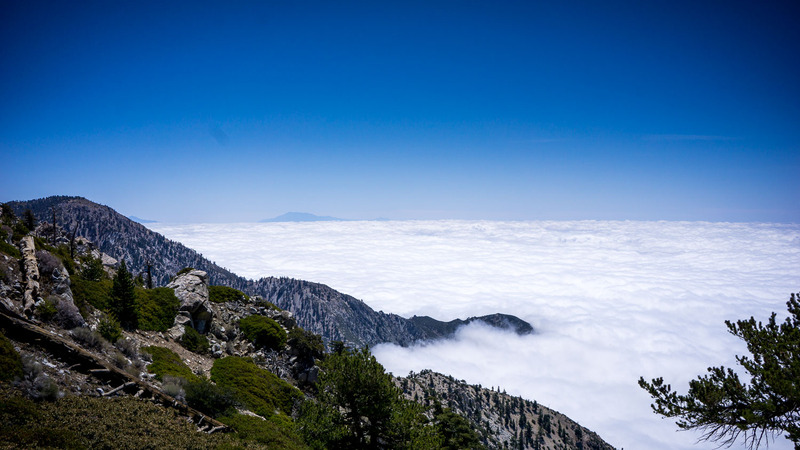 It was a “June Gloom” day across all of southern California, but the cloud line was at 7,500 feet. From our perspective, we were greeted by a sea of clouds extending all the way to the ocean. It was breathtaking. After a lunch break, we decided to cut across and try to reach Bighorn Peak. Manny seemed a little reluctant after that miserable slog up Ontario. It looked really close, but it turns out it wasn’t. We were both pretty beat, but we pressed on and made Bighorn Peak. On the way down, we had planned to connect to the trail and follow it back down to Icehouse Canyon, but somewhere along the way we lost the trail. Thanks to how tired we were at that point, we just took kind of a steep shortcut to the Icehouse Canyon trail. Overall, I don’t think I ever want to do this hike again. It was just too dangerous with all the loose rock. To quote Manny: “It was one of the hardest things I’ve ever done.” I won’t disagree with him—on a scale of one to ten, that hike was probably an 8. The steepness reminded me of Mount Rainier without the glacier. The devil may not live on Diablo Mountain, but there are a lot of falling rocks that live in Falling Rock Canyon. I don’t care to visit them again anytime soon. From the 210, take the Mount Baldy exit and travel north. Go through Mount Baldy Village and continue up the hill for a few miles. Take a right at the fork in the road toward Icehouse Canyon. The road ends in a parking lot. Get there before 7am on the weekends or you will have to park a long way from the trailhead. You will need to display the National Forest Adventure Pass to park at the trailhead. These can be obtained at the Mount Baldy Ranger Station on the way up.